Tagged under Masamune Shirow, Series. Clearly, Appleseed is a movie that leaves a strong impression on the viewer. Apart from the breathtaking graphics and elaborate sound effects, this film raises strong moral issues and ultimately questions the very foundation for the continued existance of mankind. 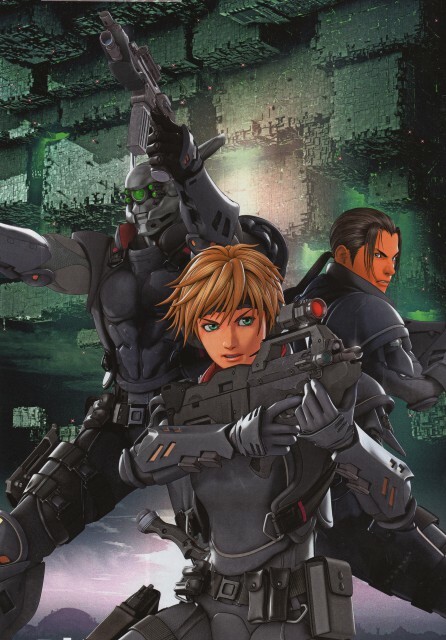 For those of you who seek a thrilling two-hour ride into a futuristic and unpredictable universe, Appleseed will undoubtedly prove to be an unforgettable experience. On the other hand, for those of you who like an to search for a deeper meaning, this film will definitely make you wonder about some things that you took for granted up until now. Either way, Appleseed is a movie that you definitely shouldn't miss. It's worth every minute. Appleseed seemed like such a different and thought inspiring film for the time it was made. The peaceful society with everything "ok" has been done before, but this movie made it feel so different, so unique (as if it had not been attempted before). It really is something when artists can approach a genre and type of movie that has been made before and make it in such a way that it feels completely unique. One of the many anime affecting the question of the relationship of body and soul. Is it possible to preserve their identity and be a man, when your body - a set of metal parts. Or is it better to be such a "man" rather than a body with no regrets and compassion for the lives of others. This is a very good anime, but I prefer graphic 2D. Oh, and "Ghost in the Shell" I saw earlier than "appleseed"
For an action anime.. i dont really know how to rate it. I mean whats with the romance with the action.. indeed it doesnt fits to the beat. Although we know that action can be matched with romance but to perticular extant. sigh. the romance reminded me of Love and Clover, i have rated it average..but waiting for your comments when you watch it and give away my misunderstandings via my guest book. Yeah, they switch the channel EVERYTIME I try to watch this series. >O Or..OVA?? Not sure. hope there's a series, didn't care for the 80s version. I have heard there is a series coming, but rumors don't often equal truth. I own both the movies and found them to be refreshingly interesting. a post war movie in a scifi theme setting. quite dark, yet with just a hint of romance, it's hard to believe it was in just the right places to be suitable for my taste.